The Town is pleased to announce the installation of new Walk Atlantic Beach signage. The AB Loops are well-marked routes around Atlantic Beach that encourage people to get out and walk or bike. 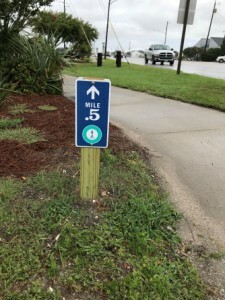 Whether it is for exercise or just to get from one place to another, walking and biking are great ways to live a healthy lifestyle and a fun way to get around our small beach town. The program is made up of four different loops each covering a different area of the Town. The Red Loop (1 mile) explores AB’s west end and passes by the sound side Pelican Street Pier, the Blue Loop (3 miles) starts along the boardwalk and takes you by ocean views, the Green Loop (2 miles) takes you through the heart of town, and lastly the Yellow Loop (3 miles) leads you to explore the east end of town through the Cottage District. There are five large maps which show all of the loops as well as give descriptions and lengths of each. 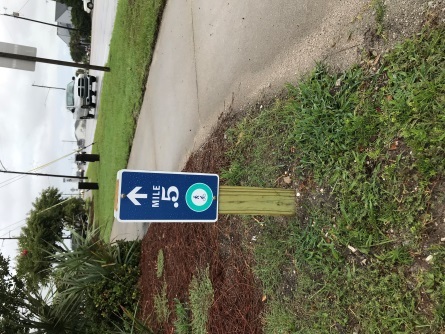 These signs are located across from the DoubleTree Hotel, the Town Park, the Circle, the Bridge Side-Park, and the intersection of Dunes Ave/E. Fort Macon Rd. 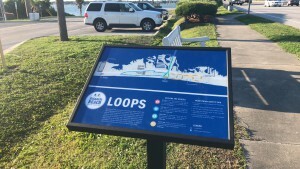 In addition to these large maps, each loop has small mile marker signs throughout to guide the walkers/bikers along its length. We hope that citizens and visitors will enjoy using these new easy-to-walk loops and exploring our town while doing so.